Social performance involves working with communities to reduce the impact of our operations and share the benefits of our activities. We respectfully engage with relevant parties, evaluate impacts, plan mitigation strategies and find opportunities to help communities, such as helping to build local economies through the creation of jobs and business opportunities. Our community feedback mechanisms enable members of the community to share their concerns with us and help us learn how to better address them. We aim to provide opportunities for local companies in countries where we operate. We have management systems in place that set out our social performance requirements. These define requirements for activities such as engagement and impact assessment, and align with international standards. We have specialist employees who support our managers to ensure we meet these standards. Each year we review the extent to which our operations, as well as our contractors and suppliers, have processes in place to prevent violations of human rights, such as the use of child or forced labour. We continue to build a systematic approach of early identification and mitigation of social impacts. In 2013, we trained 441 more employees in our social performance requirements. Across our operations we invest in projects that benefit communities. We aim to make our social investment projects beneficial to society in measurable ways and to be sustainable beyond Shell’s involvement. 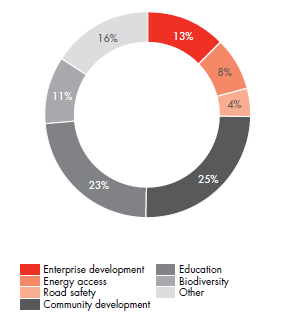 In 2013, we launched a tool across Shell to help us to better evaluate the impact of our social investment projects. Also in 2013, we spent around $159 million on voluntary social investments worldwide, compared to $149 million in 2012. This rise was mainly due to increased spending in the Philippines, Qatar and Oman. We spent around $41 million on our three global strategic themes of enterprise development, road safety and energy access, and around $118 million on our locally tailored programmes covering community development, disaster relief, education, health and biodiversity. We estimate that almost $74 million of our spend in 2013, compared to $67 million in 2012, was in countries that according to the UNDP Human Development Index 2013 have a gross domestic product of less than $15,000 a year per person. Our figures do not include investments that are part of contractual agreements with host governments. We also provide significant support through voluntary work by Shell employees and donations of equipment. Where possible, and when it makes economic sense, we buy goods and services from local suppliers and provide support to develop local businesses and skills. For example, in 2013, we signed contracts with local suppliers to provide equipment in countries such as Nigeria and Qatar. In 2013, we spent around $65 billion on goods and services worldwide. Around two-thirds of this was spent in the USA, Canada, the UK, the Netherlands and Nigeria. We estimate around $12 billion was spent in countries that have a gross domestic product of less than $15,000 a year per person, according to the UNDP Human Development Index 2013. 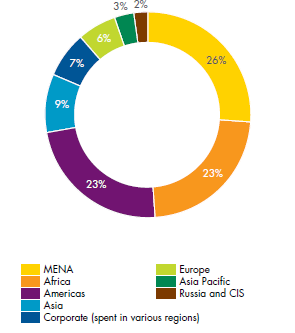 In these countries, Shell companies spent over 80% of this $12 billion with local companies. We check that our suppliers are complying with key sustainability criteria, including good working conditions. In 2013, we conducted 72 rigorous assessments of suppliers in Africa and the Middle East; 150 in the Americas; 182 in the Asia-Pacific region, and 173 in Europe to check their compliance against our Supplier Principles in areas such as human rights, labour practices and business integrity.